Mofongo. What a funny word! However there is nothing funny about how delicious that thing up there can be. This is the story of how I discovered scrumdiddlyumptiousness called Puerto Rican cuisine. The story is actually quite simple. I wanted to take one of my dear friends out to dinner. I found a Groupon for a restaurant in North Hollywood called “Mofongos” with stellar Yelp reviews. We went to eat and I was blown away. So here is the answer you’ve been waiting for: A Mofongo is basically a fried, mashed plaintain bowl that can be filled with beef, chicken, or shrimp and poured with a stewed sauce. The one that I ate was made with DELICIOUS spices, mashed plaintains, and was filled with lots of JUICY shrimp and olives. The plaintain also had pieces of crunchy pork rinds which made it even more nomlicious and the plaintain just soaked up all the broth to make a surprisingly delicious (probably unhealthy but besides the point) and unforgettable dinner. We were pretty stuffed but just had to try the Tres Leches. This dessert is a cake that is soaked in tres leches (or three milks): evaporated milk, condensed milk, and heavy cream. The cake was surprisingly light and not too sweet. 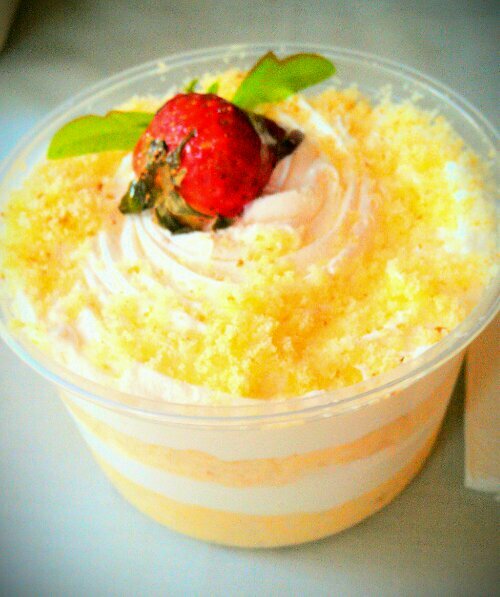 There were moist cake pieces between layers of fluffy whip cream which made it slightly reminiscent of tiramisu. A delectable way to end our lovely dinner! Later that night I started craving Mofongos. All I could think about was eating delicious Mofongos. 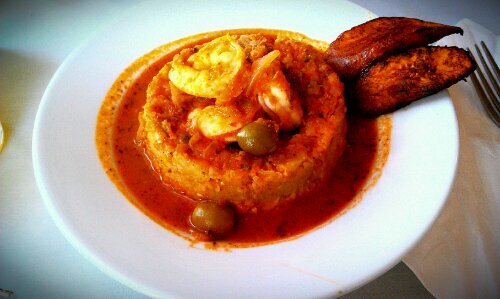 Could it be the beginning of a Mofongo obsession (Mofession? Obfongo?)?? Be sure to make reservations!